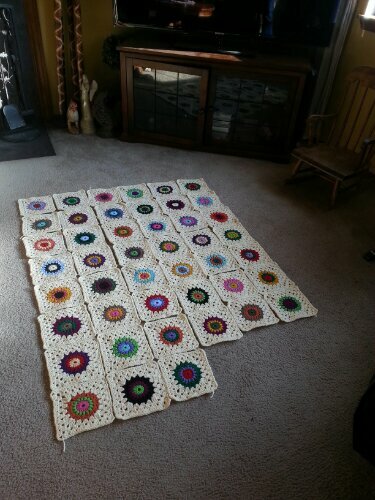 I decided to get busy on my Sunburst Granny Square Blanket .. I’m still not sure of the size I want though, … I now have 45 squares complete and will need somewhere between 48-63 squares to make a nice size blanket! I am tempted to stop at 48 so I can join them and put an edging on… I only need 48 to make a twin topper,,, 63 for a queen… Hmmmm! 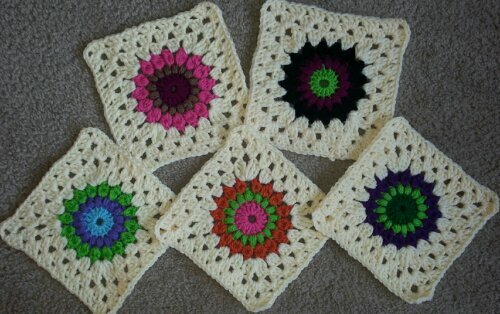 Well, I will have to decide tonight… I actually could have this beautiful blanket done this weekend if I do 48 squares! I really have enjoyed making this blanket,,, and for once I am keeping it for myself…YAY! Hopefully one of my children don’t want to steal it,,, I always give in! This reminds me of my childhood bedroom colors… My Grandmother Beatrice Ryan Ramshaw painted my room purple for me when I was 8 years old… Loved it! 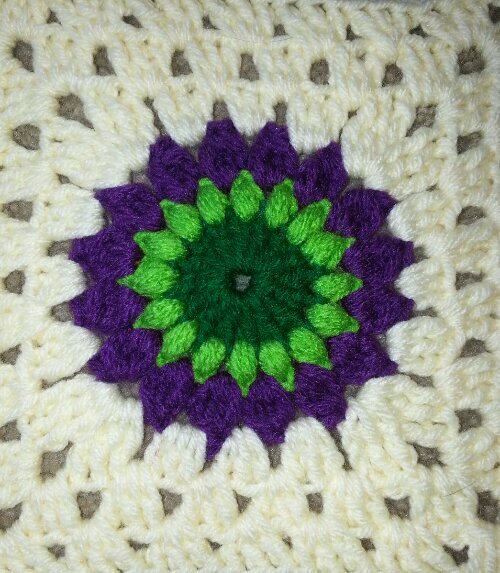 She made a crochet loopy rug in these colors for my floor… I wish I still had it… Maybe I should make a replica! Don’t forget this is still National Crochet Month… Stretch yourself into learning how to crochet, reading patterns or new stitches! Gorgeous almost-blanket! 😉 I love the colors you’ve used! Thanks so much for linking up at Hookin On Hump Day!